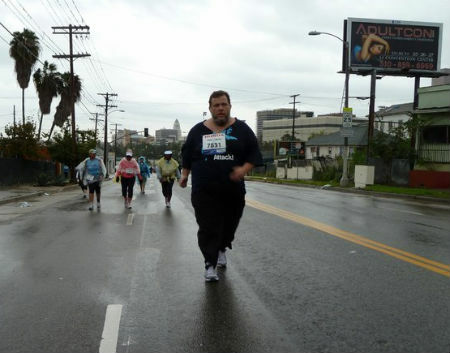 The heaviest person to complete a marathon was Kelly Gneiting (USA) who completed the 2011 Los Angeles Marathon weighing 400 lb (181.44 kg) in Los Angeles, California, USA, on 20 March 2011. Gneiting, a national champion sumo wrestler, finished the race in 9 hr 48 min 52 sec. Gneiting weighed 400 lb a half hour before the start of the race and had dropped to 396.2 lb by the conclusion. Kelly Gneiting is officially the heaviest person to finish a marathon ever. The 400-pound, 6-foot tall, sumo wrestler set the Guinness world record for being the heaviest person to finish a marathon Sunday, according to the LA Times. Gneiting is also a 3-time U.S. national champion sumo wrestler. His time was 9 hours, 48 minutes, and 52 seconds, according to the LA Times. He destroyed the old record of 275 pounds, and beat his own unofficial personal best of 11 hours, 52 minutes, and 11 seconds according to Fox Sports. Gneiting never doubted his ability to finish. "I honestly think I'm one of the best athletes in the world," he told the LA Times prior to the race. After jogging the first 8 miles, he walked the final 18. According to Fox Sports he claims he was delirious from mile 10 onward. "I was really struggling in the last five miles," he told the LA Times, "but I said to myself, 'If I have to crawl, I will.'"